Eugene Magee. Pic by INPHO. 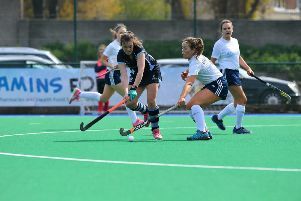 Banbridge Hockey Club have five players included in Ireland’s 24-strong training panel for World League Two. The tournament is due to be hosted in Stormont next month and Eugene Magee, Jamie Wright, Matthew Bell, Drew Carlisle and Jonny McKee have all been included in Craig Fulton’s panel. That’s as well as Banbridge-born Luke Madeley, currently playing for Three Rock Rovers. He is one of two uncapped players to be included, alongside Annadale’s Callum Robson. The news comes as just reward for what has been a stunning season for Bann so far. Mark Tumilty’s side continued their charge towards the IHL title on Saturday when they cruised past Pembroke Wanderers 3-0 at Havelock Park. Bann took the lead inside the first minute. A long overhead from Matthew Bell led to confusion in the Pembroke defence which resulted in a penalty corner. Although Eugene Magee’s initial flick was well saved by Mark Ingram, Magee made no mistake with the rebound, smashing an unstoppable shot high into the net. Play at the start of the second quarter was more measured after the frantic pace of the first. Pembroke had more possession but were unable to trouble the Bann defence. Bann went two ahead from another penalty corner, this time Johnny McKee deflecting home a well-worked variation. Pembroke dominated both possession and territory in the third quarter but again could not create any clear openings against a well organised home defence. Near the end of the quarter, Bann caught them on the break and Eugene Magee set up McKee to score Bann’s third from close in. With the result not in doubt the final quarter was played out mainly between the two circles. Bann did go further ahead after Ross Beattie finished well on the reverse after a good save from Mark Ingram fell kindly for him. Pembroke scored a consolation goal two minutes from the end when Alan Sothern powered home a penalty corner.